If you have never tried these Caramel Apple Lollipops from Charms, you absolutely MUST! 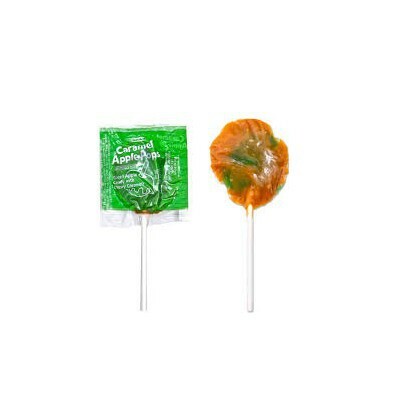 A childhood favorite for many Americans, these suckers are composed of tasty sour apple hard candy covered in a thick layer of sweet, smooth caramel. Is your mouth watering yet? Fans of caramel apples will adore these sweet n' sour lollipops, sold here in packs of 5! Sugar, corn syrup, partially hydrogenated soybean oil, skim milk, heavy cream, acidity regulator E296, whey, salt, artificial flavors, sodium caseinate (milk), soy lecithin E322, colors E133-E129*-E100ii. *May have an adverse effect on activity and attention in children. Contains GMO. Le caramel est un délice et la pomme se marie bien avec!